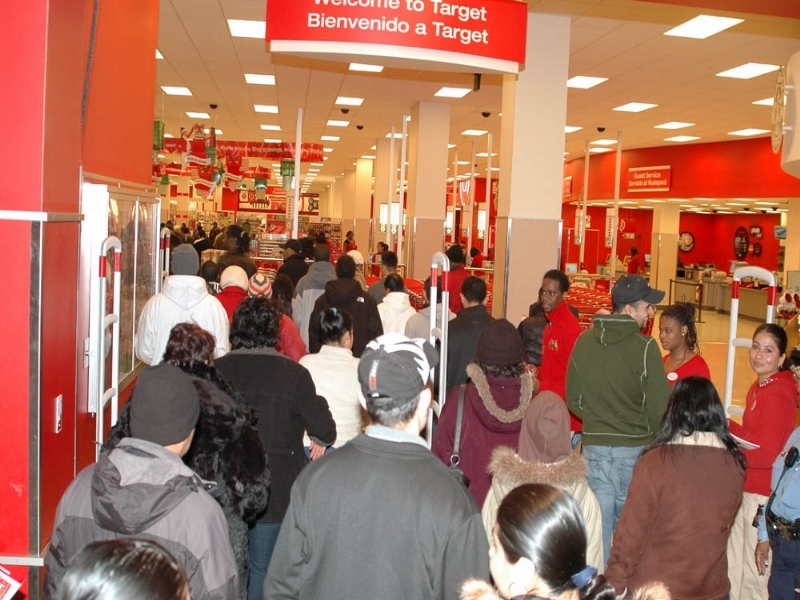 A crowd shuffles into Target at the DCUSA mall in Columbia Heights. Photo by Gridprop on Wikimedia. Last week, an international student in my class declared that Thanksgiving is a terrible holiday — a time when people are killed. “What do you mean?” I asked, madly searching for some explanation. I recalled that suicide rates spike during the winter holidays, but I didn’t think that was it. The student then explained that she’d learned about the origins of Thanksgiving and how it arrived amidst a virtual genocide of indigenous Americans. The other students and I had to admit that was true. This mortality-Thanksgiving connection is, indeed, part of U.S. history. Then, as the discussion continued, another student helpfully pointed out that it wasn’t just a dark spot in our past. In very recent memory, post-turkey shopping turned deadly. It happened again last year. The international student wasn’t at all surprised.